Borderlinx | Buy Maje and ship worldwide with Borderlinx. Cheap rates guaranteed. Introduced to the art of crafting garments at an early age, Judith Milgrom, the creator of Maje likes clothing that can tell a story. Fascinated by fabrics, embroideries and lace, the designer infuses her collections with a very feminine touch. The Maje wardrobe blends classical shapes with sharp details and creates glamorous and bold silhouettes. Trendy or bohemian, always sensual, Maje's creations are a perfect reflection of the Parisian woman. You want to wear some Maje USA and have your clothing shipped right to you? 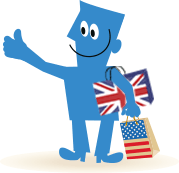 Buy from Maje in the USA and have it sent to you overseas with Borderlinx! Shipping, tax & duties can be calculated beforehand with our Shipping cost calculator, so you don't run into any surprises. A number of services are available through Borderlinx to make international ordering from Maje hassle-free, including concierge, free repacking and consolidation services.